Off-Road Events You Need to Experience! An early arrival of spring this year has got the wheels spinning in the dirt and gravel ahead of Mother Nature’s usual schedule. Whether you are looking for a new challenge, or perhaps a ride where you can plan a weekend trip to a scenic destination, there are plenty of upcoming events in the area. For those new to the term ‘gravel grinder,’ they are simply gravel road rides or races, which combine riding on surfaces such as asphalt, gravel, dirt, and some singletrack trails. One of the clear benefits of these types of events is it opens up new areas of exploration and it also brings a new kind of challenge to a rider. There are many reasons to sign up for events including giving yourself a new fitness goal to work towards, building mental toughness – a few of these events are true character builders – and of course the most important, having fun with like-minded cycling folks! Here are a few of the highlights of some upcoming exciting off-road events. Check out their websites for further information and details on how to register. Farmer’s Daughter Gravel Grinder in Chatham on Sunday, May 15 – This is a challenging, but non-competitive ride, that will allow you to see some of the most stunning scenery in and around Chatham – think postcard type views. The route is about 65 miles long, but bring your climbing legs because it rolls up and down the entire way, adding up to about 6,100 feet of climbing. It is a mix of road, dirt roads, grass and a bit of singletrack to keep things interesting. Several of the sections on the course are on private land so it’s a unique opportunity to ride this full route. The second annual gravel grinder shares its name with Chatham Brewing’s “Farmer’s Daughter” Rye IPA, and those over 21 can enjoy a pint at the post-ride festivities, along with food and live music. Visit: farmersdaughtergravelgrinder.com. Whiteface Mountain Bike Festival in Wilmington on Friday-Sunday on June 3-5 –There are a wide variety of activities during this festival weekend, just outside of Lake Placid. Saturday includes the Whiteface Mountain Uphill Bike Race (see page 1), free group rides (including “Poor Man’s Downhill” shuttles), bike demos, children’s activities, food, music and vendor expo. The evening brings a Bike Fest Beach Party with food, drinks and live music. A weekend highlight is the sixth annual Wilmington Whiteface 100K & 50K XC MTB Race on Sunday morning, with solo and relay divisions. This race is actually 69 miles (don’t be fooled by the ‘100K’) and it includes gravel roads, jeep trails and singletrack trails, near Jay and Saddleback mountains in the High Peaks. When most people think of Wilmington they think of skiing down the slopes, but in this event the bikers are challenged to go up; straight up! This race is a qualifier for one of the most revered races in the world, the Leadville Trail 100 MTB which is held annually in August at Leadville, Colo., through the heart of the Rocky Mountains. The Leadville race is notoriously difficult to get into and you have two options: winning the entry lottery or qualifying as a solo rider in the Leadville Race Series – this is the only qualifier east of Minnesota. It is important to note that if you didn’t get the training miles in to prepare for the full course there’s a 50K option. Go to: bikewilmingtonny.com or wilmingtonwhitefacemtb.com. Black Fly Challenge Gravel Grinder, Inlet to Indian Lake, on Saturday, June 11 – This is a classic race in the Adirondacks and offers a point-to-point course that switches direction every year. This is the 21st year, so the direction is from Inlet to Indian Lake, and the distance is 38.5 miles. The course is challenging and the majority is off-road through the Moose River Recreational Area. This ride attracts mountain bikes, fat bikes, cross bikes, and the occasional tandem bike. While the Black Fly course does offer a fun challenge for a seasoned cycling veteran, it is also a great starting place for someone thinking about trying their first off-road race. The race organizers will have a prize purse exceeding $9,000 for the various categories, which adds to the fun. There is a BBQ following the event. Since this is not an out-and-back course, you must make shuttle arrangements before or after the race – either by working it out with your friends or by signing up for a shuttle service, which you can book when you register. Check out: blackflychallenge.com. The Vermont Epic in Ludlow, Vt. on Saturday, June 11 – The Vermont Epic contains three different events: a) 16th annual Battlefield to Vermont (B2VT) 134-mile road ride with 8,100 feet of climbing from Bedford, Mass. to Ludlow (see page 1); b) VT40 40-mile recreational road ride for family and friends; and c) new for 2016, the VTMonster Ride. 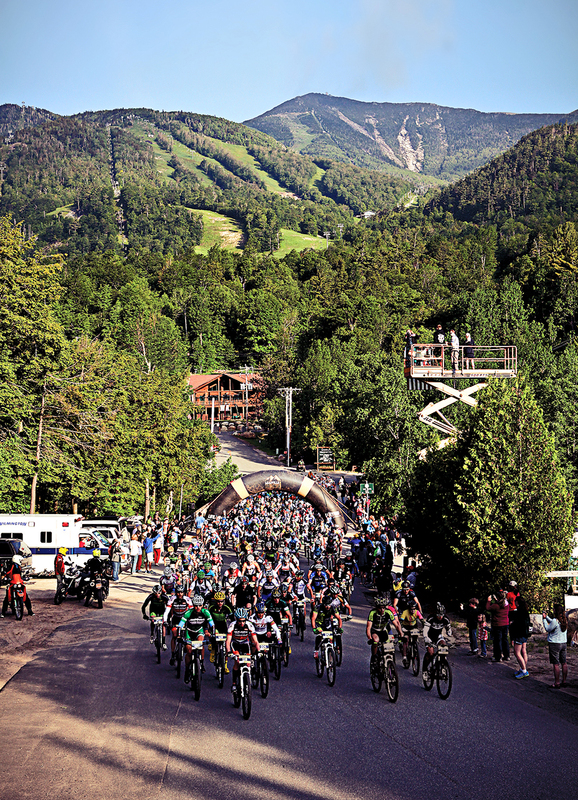 The VTMonster Gravel Grinder starts and finishes at Okemo Mountain Resort in Ludlow. It is in the ‘epic category’ for a reason, this 70-mile dirt and gravel road challenge features 9,000 feet of climbing. The scenery in Vermont never disappoints. This is the kind of challenge that allows you all kinds of bragging rights once you complete. No SAG support so be prepared to take care of yourself, although there will be two stocked feed zones. Once you survive this MONSTER the post-ride party is well deserved and features showers, Harpoon beer, BBQ, finisher’s T-shirt, an athletes’ village and live music. Visit: vtepic.com. SMBA Grafton Rocks! Mountain Bike Festival in Grafton on Saturday, June 11 – The Grafton Rocks! Fest, organized by the Saratoga Mountain Bike Association, will feature group rides and bike demos around the beautiful trails of Grafton Lakes State Park, located just east of Troy. There are plenty of exploring options in the park as there is upwards of 25 miles of a variety of trails available for beginner to expert riders. Food and beer vendors, along with raffles, will be part of the festivities. The day before is National Take-a-Kid Mountain Biking Day so in recognition of this special day, the Grafton Rocks! Fest will also feature activities like skills clinics, contests and races specifically for the kids. Go to: saratogamtb.org. Janay Camp (janay.m@gmail.com) of Malta is a passionate fat biker and enjoys exploring by bicycle. When she isn’t riding with her husband Shawne or her fat biking friends she works in the high-tech industry.